the Beef on the strainer over this Water which must continue gently boiling 4 hours then take the Beef out place it before the fire having first grated a little bread on & throw a little shred parsley turn it once or twice - then take the Gravy on your dish for the Table Garnish with horse Radish & C. Jelly. 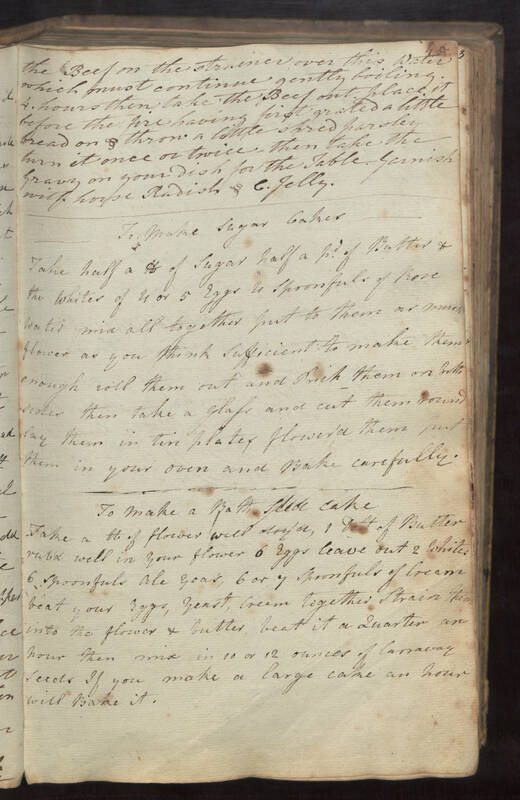 To Make Sugar Cakes Take half a lb of sugar half a pd of Butter & the whites of 4 or 5 Eggs 4 spoonfuls of Rose Water mix all together put to them as much flower as you think sufficient to make them enough roll them out and Prick them on both sides then take a glass and cut them round lay them in tin plates flower'd them put them in your oven and Bake carefully. To make a Bath Seed cake Take a lb of flowers well dry'd, 1 [Dolt?] of Butter rub'd well in your flower 6 Eggs leave out 2 Whites 6 spoonfuls ale yeas', 6 or 7 spoonfuls of Cream beat your Eggs, yeast, cream together Strain them into the flower & butter, beat it a Quarter an hour then mix in 10 or 12 ounces of carraway seeds If you make a large cake an hour will Bake it.